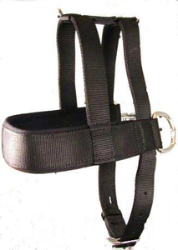 For larger dogs, harness is lined with neoprene padding. Black Only. Available in 1" width x 26" to 38" lengths. Options: 26" 28" 30" 32" 34" 36" 38"